What kind of patient care and NHS staff working conditions will come with Care Closer to Home? We know the community hubs will employ less qualified staff like physician associates and there will be big reliance on voluntary carers, family and friends. The CCGs admitted in May that they face a problem “realigning the mindset of patients, carers and clinicians to the [Care Closer to Home] vision”. Asked what this meant, Dr Judith Parker told Greater Huddersfield CCG AGM on 22nd July that this problem is about getting people to accept the need to become “resilient, empowered and enabled” to “self-manage their care” and “take control” of their health. This explanation didn’t leave me much the wiser. I think the CCGs need to explain clearly how Care Closer to Home is going to affect the care patients receive and that clinicians are able to give. Both CCGs are clear about the fact that they don’t have enough money to run the NHS as we are used to it running, and that money is only to get tighter over the next years. So if we are going to have to get used to taking care of ourselves instead of being able to access the kind of treatments we have in the past, we need to be told about this in practical terms. A consortium of organisations including Calderdale Council and Calderdale Clinical Commissioning Group (CCG) is already setting up the Care Closer to Home scheme, through the Vanguard scheme in the Upper Calder Valley which is due to be up and running next summer. The plan is for Calderdale GPs’ new private company Wainhouse Healthcare Ltd (aka Pennine GP Alliance), to run these services at a “hub” in Todmorden Health Centre, as the Wainhouse Health Ltd CEO John Tacchi told Plain Speaker recently. The fact that the GP’s company is made up of the same GP practices that make up the Clinical Commissioning Group Governing Body that will be awarding the Care Closer to Home contract should surely give everyone pause for thought. And transferring the community health services from the hospital to the GPs’ private limited company will further destablise the hospital, which is already in special measures under the NHS competition enforcer, Monitor. Is the public happy for all this to go ahead without any public consultation? 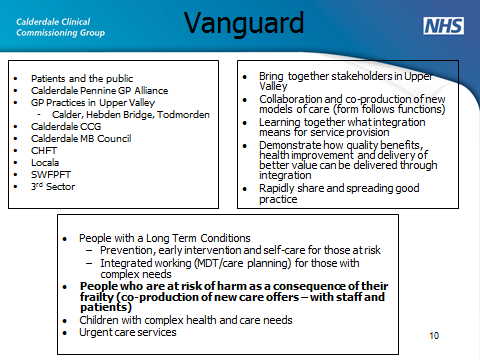 Of course it would be difficult for Calderdale Council to tell Calderdale Clinical Commissioning Group to consult the public on the whole Right Care Right Time Right Place shake-up, including Care Closer to Home, since the Council is closely involved in setting up the Care Closer to Home scheme, as shown in this Vanguard slide. The Clinical Commissioning Group had been due to consult the public on the whole Right Care Right Time Right Place scheme last September, but faced with huge public protests, in August 2014 it announced it was ducking out of the consultation and going ahead with setting up the Care Closer to Home scheme and would consult on the hospital cuts later. Although the Council, through the Adults Health and Social Care Scrutiny Panel, has the power to tell the CCG when and on what it must consult the public, it shied away from using its power then, and has continued to do so since. The Council motion to delay the hospital cuts consultation while greenlighting the Care Closer to Home shake up looks like an attempt to show that they’re taking action to protect the hospital, while in reality they’re steaming ahead, hand in glove with the CCG, in setting up the Care Closer to Home scheme, with no evidence that this scheme is going to give patients an acceptable level of care, or that it will cut acute and emergency hospital admissions. And once the Care Closer to Home Scheme has been set up, many hospital services will already have been cut, so any public consultation on the future of the hospital will be meaningless, because it will be essentially about a more or less done deed. The CCG will brush off the Council’s motion and say what they’ve been saying for months now, that they’ve been taking individual community services out of the hospital and putting them in GP practices and community locations for a couple of years now, and they have the evidence from these examples. The motion is an exercise in spin and futility. This entry was posted in Social fairness and tagged Calderdale A&E, Calderdale Clinical Commissioning Group, Calderdale Council, Care Closer to Home, Right CAre Right Time Right Place by jenny. Bookmark the permalink.